In the mid-80's, a stuffed toy was released that was targeted for boys. The creature was called My Pet Monster and was released by the Amtoy Toy Company in 1986. My Pet Monster was a huge, mostly blue creature with a big nose, yelow eyes, large fangs, and wore a pair of shackles (so he wouldn't hurt anyone). The mid-eighties produced a lot of toys which were ugly but also adorable looking despite their ugliness. Remember Madballs? 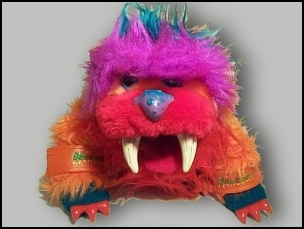 In a bit of irony the American Greetings company who had made their name with such cutesey girl's lines like Strawberry Shortcake and the Care Bears, were the folks who thought up this ugly but still cuddly monster. Boys finally had a stuffed toy that was cool and that most girls wouldn't touch. Nearly every kid wanted this big fella when he was released and he was one of the better selling toys of that Christmas season. Their popularity extended over into coloring books, t-shirts and their own saturday morning cartoon which ran from 1987 until 1988. In the cartoon, the Monsters came to life every time someone took off the magic shackles, which would allow he and his boy owner to have all sorts of adventures. The line did well enough for them to release a bunch of smaller hand puppets. This line was called My Monster Pet. They had scary names such as Gwonk and Wogster, and were also adorned with rubber shackles. Unfortunately these creatures never really caught on as the big 26-inch monster did and they hung on the toy shelves for quite a while and were eventually reduced for clearance. By the time they were released in 1988, the novelty of My Pet Monster had sadly faded. Kids had moved on to other things and felt they were too old to have a big stuffed monster toy. The monster who started it all was now a fixture in flea markets and garage sales for years. But the good news is that you can get the monster for a relatively cheap price today. He usually selly for 15.00 dollars in good shape. He is often missing his shackles so a complete one is getting a little harder to find, especially as nostalgia for toys of the 80's is starting to peak. If you find one or you have one packed away somewhere, now would be a good time to get reaquainted with this scary but cuddly toy, that many kids from the 80's remembers as their friend - My Pet Monster.